If you love modern design and looking for the contemporary floor lamp then this lamp by Brighttech is definitely worth of your attention. 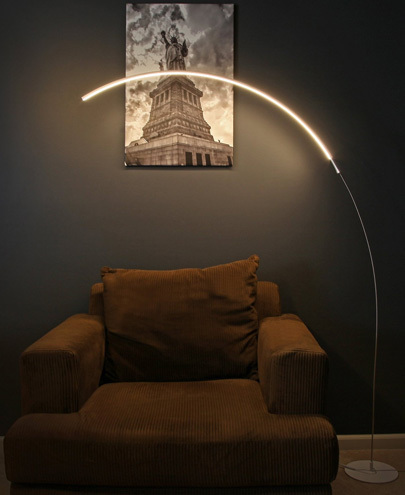 The Sparq LED Arc Floor Lamp by Brighttech will brings new look for your room or office and will be a highlight in your design. This lamp will never overheat since it’s LED. 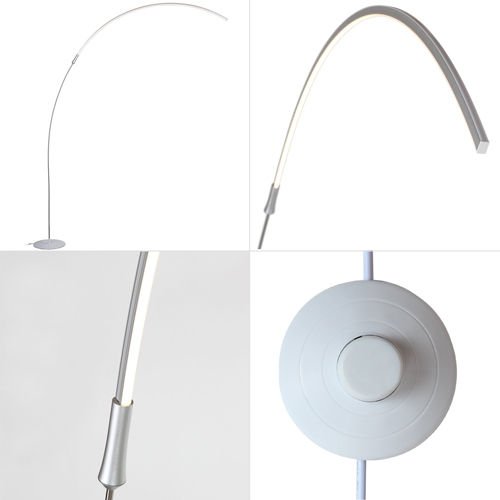 The power consumption of the lamp is only 15 watts, so it is really energy-efficient arc floor lamp. The lamp shines with warm soft light that is ideal for long reading of your favorite book or creating an intimate atmosphere for your beloved. The color temperature of it is 3,000 Kelvin and has a 2,000 Lumens. It has a simple on/off foot pedal switch that you can put on the floor in a convenient location. Unfortunately the LED bulbs of this lamp can not be easily replaced if it will burn out. But, the LED bulbs have really long live. They are designed for more than 50,000 hours of continuous operation which is 50 times longer than incandescent bulbs. And if you will use it 8 hours per day it can work at least 17 years. This Brightech Sparq floor lamp can be really easy assembled once you have unpacked it from the box. It will take only few minutes to assemble it. This lamp has no dimmer and has only one brightness setting. For many people that it can be a significant disadvantage but if you want to have such opportunity you can try to use any external lighting dimmer. All Floor Lamps by Brightech have a 3-year warranty. Which is pretty a lot. The price of this contemporary arc floor lamp is impressive. For today you can buy it for about $89.99 and it is really cheap for such quality and beautiful floor lamp. So if you are looking for the best contemporary arc floor lamp this one can become such lamp.